The Edo State Governor, Mr. Godwin Obaseki, has said that he is running a government that will ensure maximum benefit for a larger number of Edo people and residents than distribute the funds to a few cronies, noting that his commitment to development will not wane. 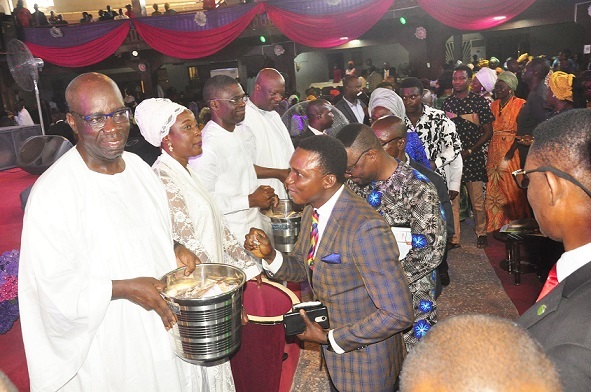 The governor said this during the Alaghodaro Thanksgiving Service held at the Church of God Mission International (CGMi), Faith Arena, in Benin City, adding that his emergence as a governor was God’s wish. His statement follows the endorsements by senior clergies in the state, of the various reforms initiated by the Obaseki-led administration in critical sectors such as education, health care, employment creation amongst others. The endorsements came from the Chairman, Christian Association of Nigeria (CAN), Edo State chapter, Bishop Oriname Oyonnude Kure; President, Pentecostal Fellowship of Nigeria (PFN) Rev. Felix Omobude and the Archbishop of Church of God Mission International (CGMi), Dr. Mrs Margaret Idahosa. “I am here today because He (God) made a way. God made it possible for me to be the governor of Edo State and he has guided my every step along the way and in everything we have done since assumption of office,” Obaseki said. The church ceremony is part of activities marking the second-year anniversary of his administration. “At the start of my administration, I made a promise before God to set aside one Sunday every year to offer thanksgiving to God for what he has achieved for us in Edo State,” said Obaseki. Going down memory lane, the governor recalled that he resolved a long time ago to put people of Edo State ahead in his policy formulation and governance. “We wanted to take governance to the people. We wanted to leave a legacy to Edo people where they will see governance as not exclusive to a few people. Restating his commitment to a government that priorities the people above any other interest, he said, “As a government, we want to take government to our people; we don’t want to keep government in Government House, anymore. The government truly belongs to the people, whether churches, schools or social gatherings. We want to integrate the people more into what happens in government. “We decided before now that we have come to change Edo State. We came up with the mantra, “let the people lead,” and when I was campaigning across the state, I assured that we would continue to put the people first. Whatever we do as a government, it must influence and impact the majority of our people. He expressed appreciation to the Christian Association of Nigeria (CAN) for being a pillar of support in terms of prayers and admonition and drawing his administration’s attention to things that needed urgent attention. He said the choice of Church of God Mission as the venue for the thanksgiving was informed by the contributions made by the founder of the church, late Archbishop Benson Idahosa to the Pentecostal movement in the country. Obaseki took the first bible reading from Psalms 31:21, the Deputy Governor, Philip Shaibu, handled the second Bible reading from Psalm 104: 1, while Mrs Betsy Obaseki took the third reading.